Up to 10,000 tennis balls are incorporated into a single cushioned court surface and can provide a 21% force reduction. By lessening the impact traditional hard courts have on a player’s joints, these courts will extend the tennis careers of players of all abilities, protect young players whose bodies are not fully developed, and perhaps pull a few seasoned players out of a too early retirement. 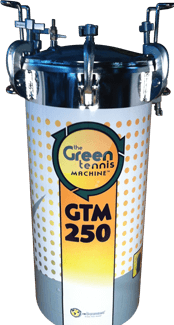 Simply collect 200 or more tennis balls in one box. Fill out the request form – be sure to include email and phone. We’ll email you a pre-paid shipping label. Please complete form on this page. Want to Recycle Tennis balls ? Please join the nationwide tennis ball recycling movement! Include the number of tennis balls per box OR the weight of each box you are sending….MUST be more than 200 tennis balls per box! While the tennis ball recycling program is free to join, we cannot currently accommodate small packages, however you can send them directly to us. reBounces will email you a prepaid shipping label so you can join the tennis ball recycling movement. Click here to go to the RECYCLING LABEL REQUEST page. We’ll put them to good use and you’ll be doing your part to green the game. Quick Fact — Rebounces began the First National Campaign to Recycle Tennis Balls in 2008!! We are the leader in “Eco Tennis”.